The US has told Japan it might resume large-scale joint military exercises with South Korea as early as next spring unless there is tangible progress on the denuclearization of North Korea, according to a Japanese news report Tuesday. The US has consulted with Japan about the plan a number of times since September, Japan’s Kyodo News Agency reported, citing Japanese government sources. It floated the possibility of a resumption of two major South Korea-US exercises -- Key Resolve and Foal Eagle, according to the sources. The joint military exercises between South Korea and the US have not been held since US President Donald Trump suspended them in June as a goodwill gesture following a historic summit with North Korean leader Kim Jong-un in Singapore. Seoul’s Ministry of National Defense said it is consulting with the US on whether to resume next year’s joint military drills and that a decision would be made by Dec. 1. The news report comes amid a lack of progress in denuclearization talks between North Korea and the US as they wrangle over who should be the first to make a concession. Pyongyang is calling on Washington to ease sanctions before it takes further steps to dismantle its nuclear weapons program, while Washington is demanding Pyongyang take more concrete, irreversible denuclearization steps first. Amid the stalled denuclearization talks, the US is stepping up pressure on North Korea by calling for tighter enforcement of international sanctions against the country. The US and South Korean marines began small-scale joint drills on Nov. 5, which the North denounced as running counter to the Koreas’ military agreement in which they promised to lower tensions along the border. The two-week drills are “directly against the inter-Korean military agreement that promised to eliminate practical threats of war and fundamental hostile relations from the Korean Peninsula,” an editorial in North Korea’s state-run newspaper Rodong Sinmun said. 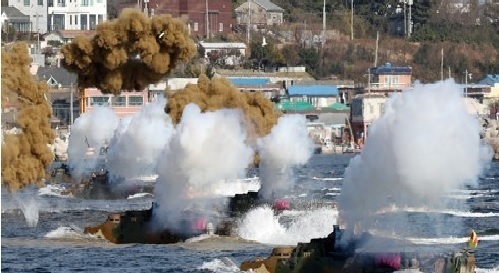 North Korea has denounced the South Korea-US joint military exercises as rehearsals for an invasion, while the US and South Korea have said the drills are defensive in nature.